NWHikers.net - View topic - Aarn Packs? Forum Index > Gear Talk > Aarn Packs? Hey folks. If you have any questions about the Aarn system, I would be more than happy to answer them. I am part of the US distribution team for the packs. I won't be a big intrusive poster here, but am always willing to help you out. Both Freesolo and Franco that posted above have been longtime Aarn users. And Freesolo is actually based out of the NW, so he has lots of experience in your area. Any chance of getting dimensions (useable internal dimensions would be ideal) for the various front balance pockets? That might be a good thing to have on the website, especially if they are not available through local stores. It seems as though the camera balance pockets assume one configuration of carry a camera with several spare lens. Its hard to tell how versatile the pockets are for carrying variations, such as if you just wanted to carry a DSLR with single "walk around" telephoto. Or one lens mounted and a spare and how well it handles carrying a camera with different sizes of lens mounted for quick access. All of these things would be easy to figure out if I could see it locally, but maybe a page or two tucked away somewhere on the site showing some camera carry options might be a good alternative. After a bunch of searches, I do notice a trend that the pack may be a bit fiddly to dial-in? Is it pretty stable and easy on and off after it gets adjusted? 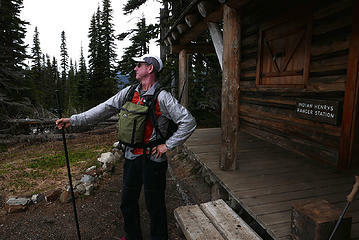 Is it another few miles of adjusting when you take a heavy jacket/fleece off or on, which usually takes a moment of adjustment with a regular pack. I must say I am intrigued by this pack and as I am slowly turning into an Old Geezer, my back requires more pampering, and all the reviews do seem to point to the balance be easier on backs...once its adjusted correctly. My camera hanging on my chest is enough for me thank you very much. Boot up - I will see if we can add dimensions to the Balance Pockets for the website this winter as we are updating the site. I will try and get a few photos with something to compare the Balance Pockets to for size - water bottle, stove, ruler. Maybe a front and side profile shot of the pockets in use on a body would help too. The Aarn packs do take a little more time to get it dialed in. But once it is adjusted for your specific body, it is extremely comfortable. No major adjustments are needed if you are shedding clothes throughout the day. Just more tightening of the standard hip belt and shoulder straps. I like to be able to see where my feet are, from time to time. You will undestand that better when you get to my venerable age....if you make it that far. Towards the end of 2009 I had the brilliant idea of suggesting dedicated photo pockets. It was so good that Aarn already had the finished prototype when I sent my suggestion to him..
"Its hard to tell how versatile the pockets are for carrying variations, such as if you just wanted to carry a DSLR with single "walk around" telephoto. " I hear that soon there will be a pocket that does just that. Usually front weight balances out nicely. I have lots of experiance carrying around a 30-40lb pack with 20 lbs of gear attached to the front. My gear attached to the front were 210 rounds of 5.56, medical gear, M4 with attachments, water, etc. I also had my camera in the front. 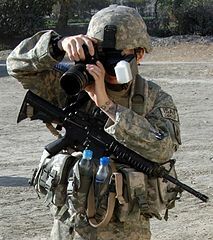 I dont have my ruck on in this pic, but you get the point. In my 15 months hiking the mountains of Afghanistan the front load in my experiance is more benificial then anything else. Anything that covers the chest area (while carrying heavy loads) causes potential problems. 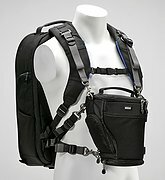 I currently have a backpack/chest harness system and it feels a little too constrictive and causes chest pain when sitting a little too high. I had to adjust it so it's lower and around the solar flex area. Just something to keep in mind. "Anything that covers the chest area (while carrying heavy loads) causes potential problems"
This point as well as the visibility bit does come up in the Aarn's threads but neither applies to the Aarns pockets. That is because the weight of the pockets is on the hips not on the chest nor the shoulders . (it can be transferred to the shoulders if you really want to...) and the pockets have a gap in between each other and the chest too. 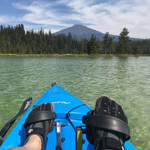 I've used front packs for years now, and they have never been a problem for foot placement. I used the larger Zimmerbuilt one for going around Adams where I spent 8 hours off trail and to date I have never tripped, slid or gone head over heels due to sight line obstruction. These packs usually hold my camera and other assundries. No tents at the moment. I liked the Pacer 1 ( I seam sealed a few) but I don't think that he, Aarn Tate, was getting the volume in sales to keep them going. Pity because he has a background with tent design. Anything that covers the chest area (while carrying heavy loads) causes potential problems. I used to carry a kid in the front, and a pack on the back. Trekking poles are needed. But it isn't hard to do.